Have you ever wished upon a star that you, like your favorite fairytale characters, could live in a castle? Well, at Arch Cape Inn, we like to think of ourselves as fairy godparents. Bibbidi-bobbidi-boo! Your wish is granted! Come stay in the best castle-like hotel near Cannon Beach for an enchanting and relaxing vacation. Read on to learn more about our amazing inn and start planning your trip today! To make your vacation even better, we’ve created a unique guide to help you navigate the area. 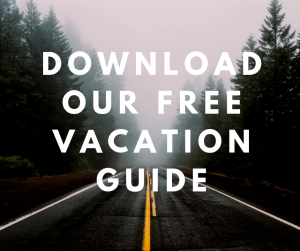 Download our free Vacation Guide and discover all the top local restaurants, shops, events, museums, outdoor adventures, and more! Picture Oregon as the far away land in a mystical story. Foggy beaches, mysterious forests, and the crashing waves of the Pacific make this the perfect destination for adventure seekers and romantic at heart. Everyone knows that a great adventure needs a grand setting, and that’s exactly what Arch Cape Inn offers. We’re the only castle-like hotel in Cannon Beach, and Travel + Leisure listed us in their top Castle-Like Hotels list. Between the dramatic Oregon Coast backdrop and our stunning B&B, one thing is certain: you’re in for a treat! The Arch Cape Inn & Retreat isn’t a real castle like Versailles or Buckingham Palace; it hasn’t stood the test countless wars, nor has it been around for centuries. However, it offers all the charm and magic of a true castle. To make your stay as authentic as possible, we have incorporated a few architectural details into our property for an extra fairytale vibe. You’ll see turrets from the outside of our inn, which create the fabulous, romantic ambiance in our Tower Room. This is the perfect accommodation if you want to feel like Rapunzel. In addition to its unique shape and feel, the Tower Room offers a luxurious soaking tub and a spectacular top-floor view of the ocean. We also have themed rooms like the Gauguin, which is filled with reproductions from the French painter. If you want to dazzle your partner, consider the Tapestry Room and its stunning stained-glass ceiling. The accommodations and luxurious amenities found at the Arch Cape Inn & Retreat are truly mesmerizing, but nothing compares to the coastal beauty of the Cannon Beach area. Now is the time to surprise your significant other with the castle-like stay of their dreams! Picture yourselves in the Tapestry Room, with its king-size bed, luxurious linens, soaking tub in the private bathroom, and the gorgeous views of the ocean in the distance. Did we mention our delicious gourmet breakfast? It’s so good that you’ll look forward to waking up every morning!